Dec. 29, 2016: For centuries, Arctic sky watchers have occasionally reported strange sounds filling the air as Northern Lights danced overhead. Hisses, crackles, and even loud “claps” have been heard and recorded. It may be time to add a new sound to the menagerie: blaster fire. Wright is a veteran tour guide working for Lights over Lapland, and he has heard these sounds before–”three times in total. Each time I was standing near power lines.” He recalls a particularly intense outburst of “blaster fire” during the powerful St. Patrick’s Day Storm of March 2015. In each case, guests and/or friends heard the sounds as well. Twas the night before Christmas. 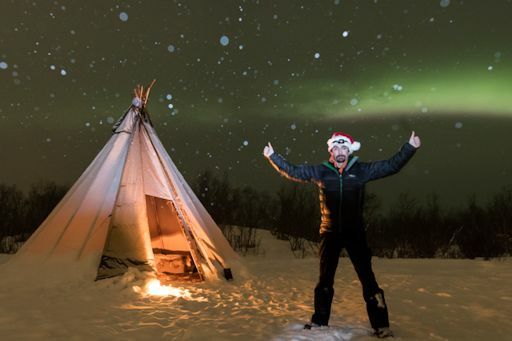 Read Oliver Wright’s aurora blog. Perhaps the most commonly reported aurora sounds are “hissing” and “crackling,” a bit like static on a radio. These are thought to come from electric fields causing spark discharges at the pointy ends of objects like pine needles or even strands of dry hair. Aurora “claps” have been recorded as well. A researcher in Finland spent 15 years studying this phenomenon and published his results in 2012. He found that a temperature inversion layer in the atmosphere about 70 meters above the ground could cause a separation of + and – charges in the air. During strong geomagnetic storms, the charge separation breaks down, causing air to move and a “clap” to be heard. The sounds Wright recorded may be a result of “electrophonic transduction”–that is, the conversion of electromagnetic energy into mechanical motion. 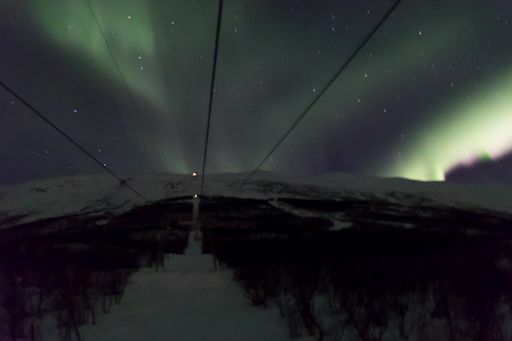 At the time of the Christmas aurora outburst, magnetic fields around Abisko were seething with activity. Physics 101: Unsettled magnetic fields can cause currents to flow in power lines. Strong low-frequency currents can literally shake objects, launching acoustic vibrations into the air. Wright may have recorded the unique sound of those power lines swaying in response to the magnetic storm. “This discussion feels poignant with the passing of Carrie Fisher as she was my childhood love and the sound is very reminiscent of Star Wars,” notes Wright. Indeed, “Carrie’s Crackles” might be a good name for these heavenly sounds. Around Abisko, people will be listening for more as the next magnetic storm approaches. Stay tuned! I’m Dreaming of a … Pink Christmas? “This was the brightest pink display I have ever seen, at one time even giving the snow a pink tinge,” he says. The pink color is probably a sign of nitrogen. Most auroras are green–a verdant glow caused by energetic particles from space hitting oxygen atoms 100 km to 300 km above Earth’s surface. Seldom-seen pink appears when the energetic particles descend lower than usual, striking nitrogen molecules at the 100 km level and below. 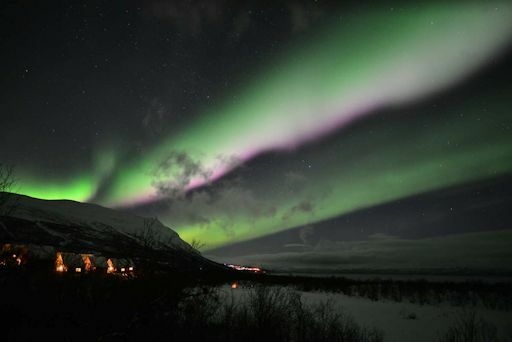 On the days and nights around Christmas 2016, the pinks became so intense, they appeared white, not only to cameras, “but also to the naked eye,” says Sarah Skinner, who witnessed the strange colors several nights in a row from Abisko, Sweden. “It looked like someone had photoshopped the sky!” she says. It is worth noting that these remarkable auroras appeared during a lull in solar activity. For three days centered on Christmas, the face of the sun was completely blank. There were no sunspots, no solar flares, and no CMEs. Instead, the display was caused by a high-speed solar wind stream blowing out of a large hole in the sun’s atmosphere. Such atmospheric holes are common during Solar Minimum, so we can expect many similar displays as the sunspot cycle crashes in the years ahead. Dec. 26, 2016: Christmas 2016 was special for sky watchers around the Arctic Circle. 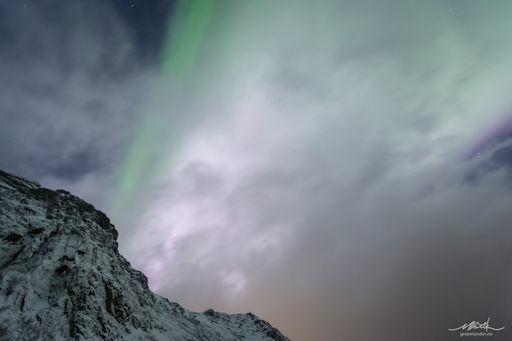 The skies filled with some of the best Northern Lights of the year, including rare outbursts of white and pink. The source of the display: A giant “coronal hole” in the sun’s atmosphere sprayed our planet with solar wind. The hole opened up in July 2016 and it has been strobing Earth with solar wind every ~28 days ever since as the hole pirouettes with the slowly rotating sun. Inset images come from NASA’s Solar Dynamics Observatory. The coronal hole is the giant dark region, starting small in July, then growing and shape-shifting as the year unfolds. The background strip chart recording shows the instability of the magnetic field around Green’s private observatory. 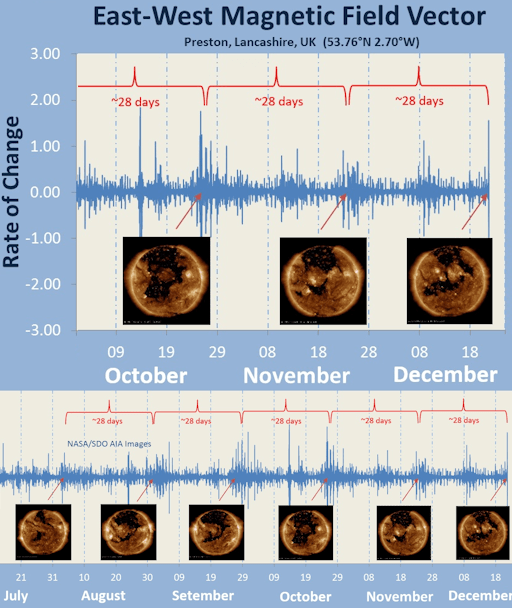 When the coronal hole is facing Earth, big changes are measured. Green’s presentation suggests that this yawning hole is a long-lived feature on the sun, and it will probably be back as potent as ever 28 days from now. Stay tuned for magnetic unrest–and more Arctic auroras–in January. Auroras get their colors from specific elements in Earth’s upper atmosphere. Green auroras, for instance, come from atomic oxygen; blue is associated with molecular nitrogen. No element produces white. So where did it come from? 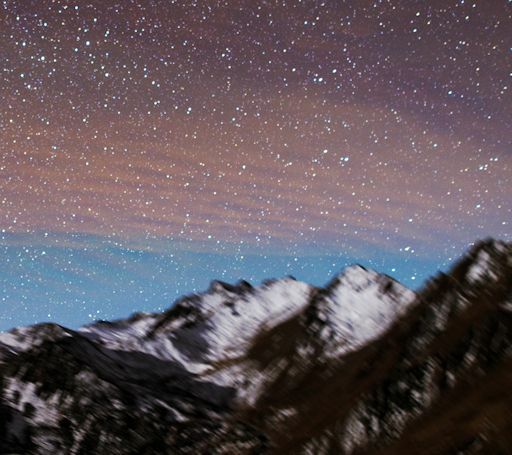 The ‘white auroras’ Varik photographed might actually be pink auroras filtered and paled by low-hanging clouds. Indeed, there is a strong hint of pink in Varik’s photo. 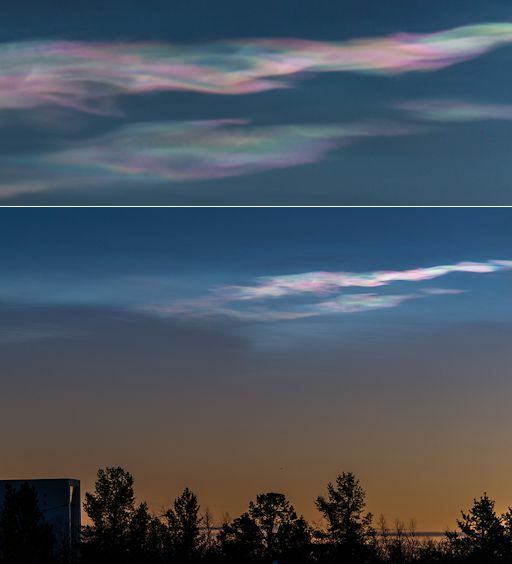 Icy polar stratospheric clouds (PSCs) form in the lower stratosphere when temperatures drop to around -85ºC. That’s how cold it has to be for ice crystals to form in the very dry stratosphere. High-altitude sunlight shining through tiny ice particles ~10µm across produce the characteristic bright iridescent colors. “Last winter we had these clouds almost daily for long periods of time,” says Stålnacke. 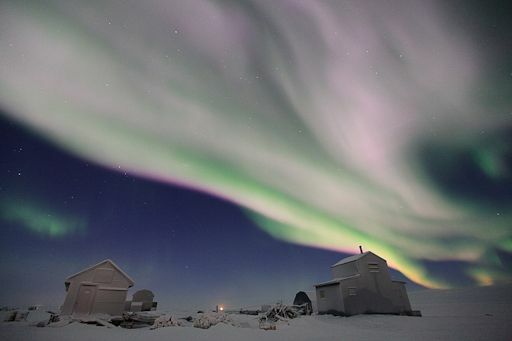 Arctic sky watchers are encouraged to be alert for more in the days ahead. The best time to look is just before sunrise or after sunset.